Obviously, the point of the course, learning to apply moral—philosophical—principles for business success, was lost on these students. 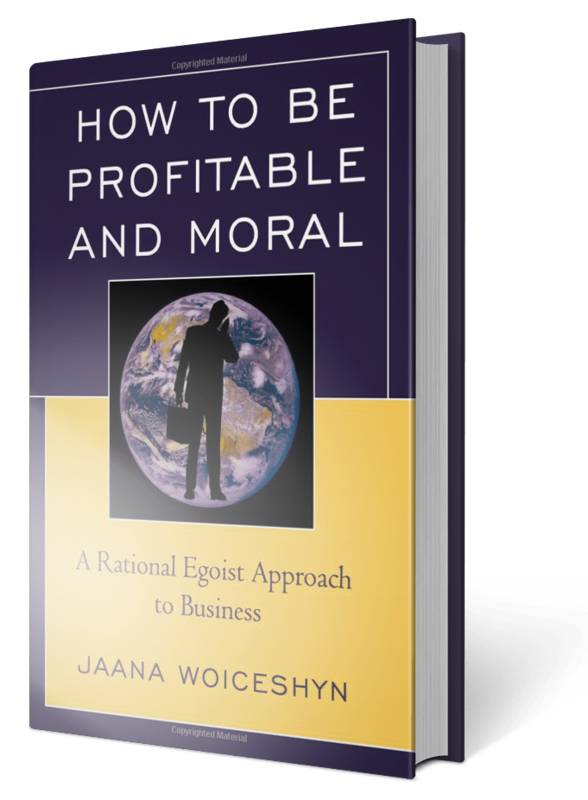 Perhaps they did not read the text book, How to be profitable and moral: A rational egoist approach to business (which I wrote a few years ago, not as text book but as “a thinking manager’s guide to ethics and profits”). Or perhaps they don’t aspire to be thinking managers but wanted a quick ‘check list’ on ethics that could help them succeed without thinking. In his speech, “Why do businessmen need philosophy,” Leonard Peikoff made the case based on three principles. Businessmen need philosophy to defend their moral right to be selfish—to pursue profits by producing and trading goods and services. Businessmen need philosophy to focus on reality, the material world, which (and not on any supernatural realm) makes production and trade of material values possible. Finally, businessmen need philosophy to accept reason—thinking—as their only means of knowing reality (as opposed to acting based on reading tea leaves, consulting psychics, or on any other whims). Without these principles, long-term success in business is not possible. Businessmen standing for selfishness, reality and reason, Peikoff argued, is a matter of life and death. Not standing for these three principles makes businessmen vulnerable to attacks by intellectuals (such as university professors …) and politicians, which undermine their productivity and profitability—the ability of their business, and themselves, to survive and succeed. For examples, consider Mark Zuckerberg being subjected to lecturing by U.S. senators about how to run his business, or Bill Gates giving up his business for running a charity. I agree with Dr. Peikoff that businesspeople need philosophy so that they can produce, trade, and profit—and survive. But here I want to clarify why particular kind of moral principles—virtues—are also necessary for businesspeople, and why “checklists of practical tips” are not sufficient if success in business is what they want. Once businesspeople have learned to defend their moral right to make profits and to focus on reality by using reason, they still need more guidance for action. Businesspeople, or any others, don’t have automatic knowledge about the goals and means for achieving their ultimate goal, whether long-term profit maximization or a happy life. Yet, the choices they must make—such as large investments in technology, mergers and acquisitions, hiring key employees—are complex and their consequences long-range. There simply isn’t a ‘checklist’ to give the ‘right’ moral answer in all different concrete choices businesspeople will encounter. What businesspeople (and the rest of us) must do to make the right choice in any given situation, is to think—to use reason—to discover the knowledge that is required to achieve their ultimate goal. Such knowledge can be discovered by adhering to reality, to grasp what kind of action long-term profit maximization—and human survival and flourishing requires. Such knowledge is held in the form of a few key virtues, or action principles, that spell out (in a very condensed form) what businesspeople should do to maximize profits. Fortunately, philosophers such as Ayn Rand have identified the basic virtues that human survival and flourishing requires, also in the realm of business. Rand, building on Aristotle’s foundation, considered rationality—adhering to reality by the means of reason—as the primary human virtue, without which we couldn’t survive. The other six basic virtues: productiveness, justice, honesty, independence, integrity, and pride, are all aspects of rationality and give further guidance as to how to choose and act rationally to survive and flourish, or to maximize long-term profits. Instead of a concrete checklist, these seven virtues offer moral guidance in countless concrete situations. They don’t require a search through a long, detailed list of tips. Once grasped, they are accessible quickly (from one’s subconscious memory files) and can be applied successfully to achieve goals. But the grasping of these virtues requires thinking and their successful application requires practice—if using them is to become second nature and a dependable guide to business success. They are a thinking manager’s guide to being profitable and moral.